This means potential growth for businesses here at home. Consider the case of DiaCarta LLC, a California-based company. During our first stop in Beijing, I was honored to participate in a ceremony celebrating the company’s $2 million dollar sales agreement to sell its cervical cancer testing products in China. DiaCarta’s officials have said that past exporting has allowed them to hire workers, and this new deal would allow them to add additional staff. The equation is simple: Strengthening trade partnerships leads to U.S. exports which positively impacts American jobs. That’s the message we took to Beijing, and then on to Hong Kong, the second stop of our trade mission. Hong Kong’s development has been astounding, and it’s been a valuable partner to the United States. Last year, U.S. merchandise exports to Hong Kong totaled nearly $27 billion. Our delegation worked to build on this success by exploring new partnerships in the biotech sector; we held roughly 60 one-on-one meetings with prospective distributors, public and private buying agents and other potential business partners. Even though we’ve had great success together, we have the potential to do more, especially in promising sectors like biotechnology. I know we have the potential to do more because both sides are committed. 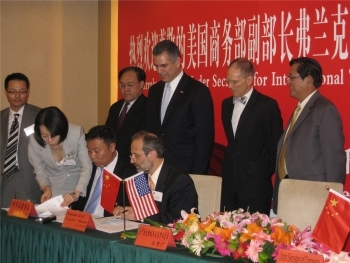 Case in point: Last November, Assistant Secretary Suresh Kumar sat with Fred Lam, Executive Director of the Hong Kong Trade Development Council (HKTDC), to sign the Pacific Bridge Initiative (PBI). 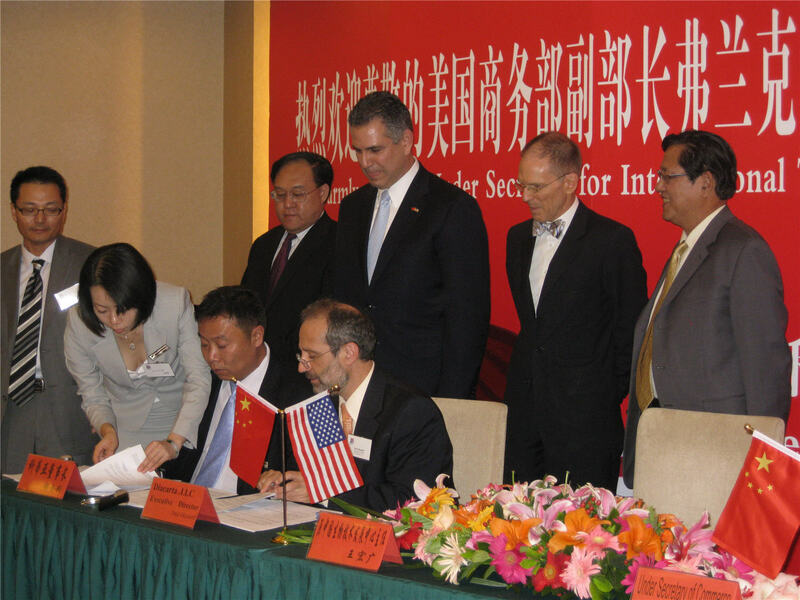 Through the PBI, HKTDC became the first statutory body outside the U.S. to promote President Obama’s National Export Initiative on a bilateral basis. The PBI has been a win-win collaboration. It’s helped us exceed our NEI goals. And, it’s supported Hong Kong’s efforts to be the pre-eminent commercial platform for this dynamic part of the world. Consider that in 2011, the PBI helped triple the number of export transactions done by new-to-market U.S. firms. It’s been a great success. Much of the credit for this progress belongs to Fred Lam. That’s why, during the AmCham luncheon, I presented him with the Peace Through Commerce Award, which honors those who significantly promote and develop U.S. exports. The award was discontinued for a few years, but it has a storied history. It dates back to the first Secretary of State—Thomas Jefferson—who commissioned the medal in 1790. Jefferson presented the award, then known as the Diplomatic Medal, as a gift to foreign diplomats who aided the Continental Congress during the American Revolution. Today, the revolution is happening in the global economy; our commercial international partnerships are more important than ever. That’s why I re-launched the award this year. I wanted to recognize great partners like Fred, which is why we honored him. And, we will continue to build on this successful partnership in the years ahead. I’m grateful to all those who supported our work, especially ITA staff. And, with all of our partners, I look forward to taking the next step in the journey to bring new prosperity and opportunities to U.S. businesses.